This article describes about the admission process to gain a PhD from the Institute of Physics IOP, Bhubaneswar. Check this article to know about the institute, the admission schedule, eligibility criteria and way to apply for admissions online. The IOP is an autonomous research institute under the Department of Atomic Energy (DAE) of India. It comes directly under the purview of the Government of India. The facility provides activities related to research in concepts of Physics. Some of the research going on in the IOP relate to condensed matter physics, nuclear physics, quantum computation, radioactive physics and high energy fields. With a PhD admission, one gets to collaborate and research with international bodies in Physics. Some of the popular ones include the CERN in Switzerland, ALICS, BNL and ANL in USA and GSI of Germany. The phone numbers are 0674-2306418, 0674-2306406 and personnel are available in between 10 am - 5:30 pm. 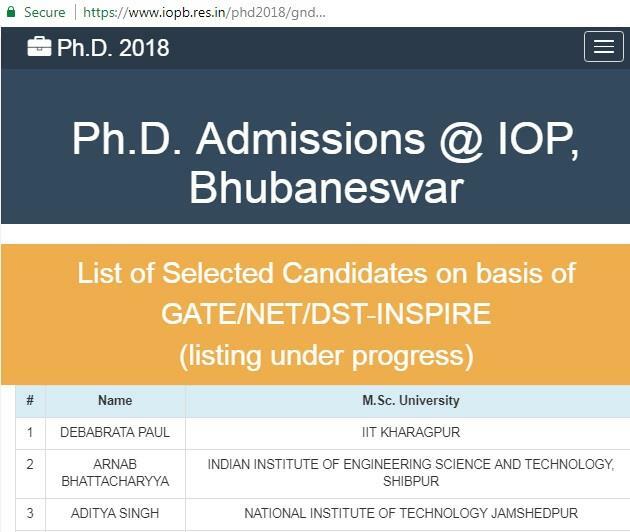 The main website for IOP Bhubaneswar is https://www.iopb.res.in/. IOP Bhubaneswar has started to accept online applications for the PhD course. The last date of application is 15th May 2018. All candidates who would be eligible for giving written tests will be informed within 1 week of registration. Candidates will have to present at IOP in between 8 am to 8:45 am. The written test will be conducted on 4th June 2018 at 9 am and will finish by 11 am. Evaluation of papers will happen in between 11 am to 14:30 pm. The results will be declared by 15 pm. 30 to 40 candidates will be shortlisted for personal interviews. These will take place in between 4th to 6th June 2018. The process will immediately begin a 15:30 to 18:30 on the 4th June. The times for 5th and 6th of June will be 9:30 am to 1 pm and 2 pm to 6:30 pm. The results from the interviews will be declared in within 1 week. Selected candidates will be awarded admission for the degree. The programme will begin from August 2018. All candidates appearing for will be reimbursed train sleeper class return ticket from their place of residence and Bhubaneswar. Candidates will have to produce their train tickets as proofs. They will also be given Rs 600 to meet living expenses. The PhD provides a coursework which spans over a year's timespan. It begins in the month of August and is prepared in such a way to assist M.Sc. graduates to take up research work with relative ease. The coursework starts from August and ends in June. The IOP further enables taking up research work under the supervision of the faculty members of the institute. Upon successful completion of the PhD, the degree is awarded by the Homi Bhabha National Institute (HBNI), which is a Deemed-to-be-University. The first 2 years of the PhD programme will include the coursework, as mentioned above. The PhD will be paid a fellowship of Rs 25000 per month. From the third year, the scholars will be given the Senior Research Fellowship grade and will be paid Rs 28000 per month. In addition to the fellowship, the scholars will be given an annual contingency grant of Rs 32000 (may be revised per year). This will allow covering expenses related to books, travel and research-related expenses. Students who are Indian Nationals are eligible to participate in the admission rounds. A M.Sc. Physics student should have a minimum of 55% aggregate. Alternatively, they should have an equivalent CGPA until the last year or semester. Students who would be giving their M.Sc. finals in 2018 can apply for the IOP Bhubaneswar PhD admissions if they complete either of the above criteria. Their admission will be provisional and subject to successful completion of the M.Sc. A student having a valid GATE score up to 200 can be considered eligible for the admissions. A student who has given the CSIR NET (JRF) examinations in within the last one year in June or December 2017 is eligible. A candidate who has DST-INSPIRE fellowship can apply for admissions. Students will have to upload supporting documents regarding the GATE/NET/DST-INSPIRE examinations and should produce in original at selection rounds.